Have you ever visited the Italian Market in Philadelphia? Well, if not, it's a magical place. There's pasta, there's cheese, there are vegetable stands, there are spice markets, meat markets, fruit stalls, ravioli specialists, and...there are even some sweets. Surprisingly, sweets aren't a huge presence in the market (I know, I know) but there are some sweet treats to be found. Today's discovery? Gelato at Anthony's Chocolate House. At Anthony's, which has been around since, there are several items of note. First, they offer at-home cannoli kits. YES! Next, they offer an array of homespun chocolate treats, including chocolate covered apples, chocolate covered figs, chocolate covered pizzelles (non-chocolate coated too, but why bother?? ), chocolate-covered chips, and other treats including torrone, pignoli cookies, and...back to the gelato. 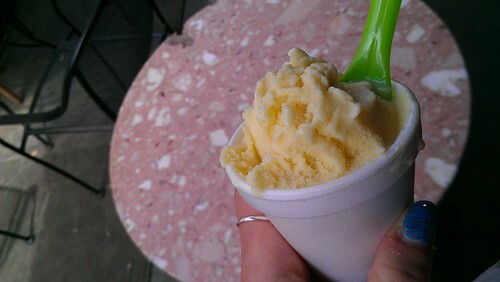 Anthony's gelato is a more icy variety, which reminded me of milk ices that I'd enjoy by the Jersey shore growing up. While one wouldn't call it luxuriantly rich and creamy, it's highly satisfying on a hot day (which it was in Philadelphia on the day in question! ), milky and icy and sweet. The butterscotch flavor was like a more mature version of the yellow butterscotch discs that I seek out in candy dishes, and definitely satisfied a nostalgic craving. If you're looking for aforementioned dreamy and luxuriant style, this may not be your stop, but definitely worth a try as you stroll the historic and bustling market. Anthony's Chocolate House, 915 S. 9th Street, Philadelphia; online here.